I only have one or two recipe involving frying, I almost never fry food…and this for many reasons, first of all for health and calories issues and last but not least for the disgraceful smell of the house that has been subject to oil particles and fumes. That smell can remain in the house for weeks and it’s not a pleasant fragrance. I ended up with a case of 9 large cauliflowers and really needed to find different ways to prepare them…After soups, gratins, salads, taboule, roasted…I finally gave in and decided to fry this last one…and to be real honest, I loved it. It can be quite addictive…I like a airy, thin and crunchy crust and that’s just the way those beignets turned out. It took them a while to get golden brown, probably because the oil was not that hot. You can of course serve those beignets with a different dipping sauce, such as a spicy tartare or garlic tofu, or any sauce you like. To keep those vegan, do not add egg white, and they’ll be just as delicious. Beignets in France are the equivalent of donuts, but I would certainly not call these donuts. The most traditional beignets are made during carnival (les beignets de carnaval) and are sweet…and of course fried in oil. The other savory versions are made with vegetables. You dip vegetables in a liquid batter, then you fry them. The origin of beignets goes back to Roman times, when Romans had various ways of celebrating the awakening of nature with all kinds of rituals and meals. They were then consumed before the period of fasting that lasted 40 days, when Catholics were eating greasy food “Mardi Gras” (fat Tuesday) to get ready for their fast. Beignets have somehow a religious historical trace, like most ancient food. Nowadays we eat donuts simply because they’re delicious, and that’s a good enough reason. Start cutting the cauliflower in florets. Cook them in boiling water for three minutes. Drain and let cool. For the batter, in a mixing bowl, beat egg white to a thick texture, then in another bowl, combine all other ingredients together. Incorporate egg white. Heat oil in a wok. Dip each cauliflower floret into the batter and add to the oil. Let each floret turn golden brown. remove from oil and drain in a paper towel. Add each basil leaf to the wok and fry for about 30 seconds until crunchy (do not overcook or the leaves will break). For the tomato sauce, heat olive oil in a pot, add 2 garlic clovess, stir for a few minutes, then add tomatoes. Let the tomatoes cook for about 10-15 minutes until the water evaporates. Remove from stove, let it cool and add all other ingredients. 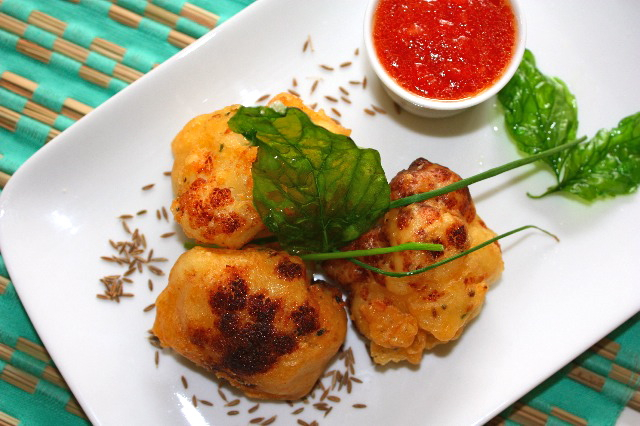 Serve cauliflower hot with dipping sauce on the side and basil leaves. This entry was posted by silvia on September 8, 2010 at 2:51 pm, and is filed under Appetizers, Vegetables, Vegetarian - dairy. Follow any responses to this post through RSS 2.0.You can leave a response or trackback from your own site. This idea works with tempura–why not a beignet?! Sometimes a little fried treat like this now and then is just what we need. Perfect idea for the beignets. Fried beautifully. Love the hot chili sauce as well. ::gasp:: i love these! i’ve never seen a savory beignet before, but this looks fantastic! i love cauliflower and the spicy tomato sauce sounds like a perfect match. i will have to make this soon! You are a master for doing this with 9 extra cases! Oh… these look mafnific! I have seen a version of these with more indian flavors, but I love your version. Thanks for the recipe! Quels beaux beignets qui ont l’air délicieux! Silvia, you are on a roll with your brilliant creations. (Your vacation to Mexico clearly was a perfect way to recharge) I would love a whole plate of these! This is such a unique creation! I’ve never had a beignets before that wasn’t covered in powdered sugar, and since cauliflower is my favorite vegetable, I’m eager to give this a try! This looks delicious and I love the fennel seed in the plate, which would make me love the smell even more! Oh these look delightful. Could you boil instead of fry? I do that a lot when I make donuts, instead of oil I heat water to extreme boil. My goodness, this sounds absolutely wonderful. I like the idea by combining cauliflower & beignets together. Simply amazing! Thanks for sharing & enjoy your day. One of the first dishes I did for my blog was a cauliflower dish much like this but with a hundred odd year old recipe. Though delicious, it didn’t have the wonderful spices of this one… can’t wait to try it! Your beignets look so delicious, Silvia. I love fried cauliflower, so I know I would love this. Now I just need to find a head of cauliflower that doesn’t look like it’s on its last leg (smile)! I am not a fan of frying too.. but this seems to good not to. Silvia, I hate frying too! The mess, the smell, the unneeded fat…I avoid it as much as possible. BUT, I would probably make an exception for THESE! These puppies sound delish! What a great idea…I bet the chili sauce goes great with the creamy caulies! Yum. Those look fabulous. I don’t fry food very often either, but that makes it a real treat when I do. These would be excellent reason to heat up some oil. Thanks for sharing the recipe. 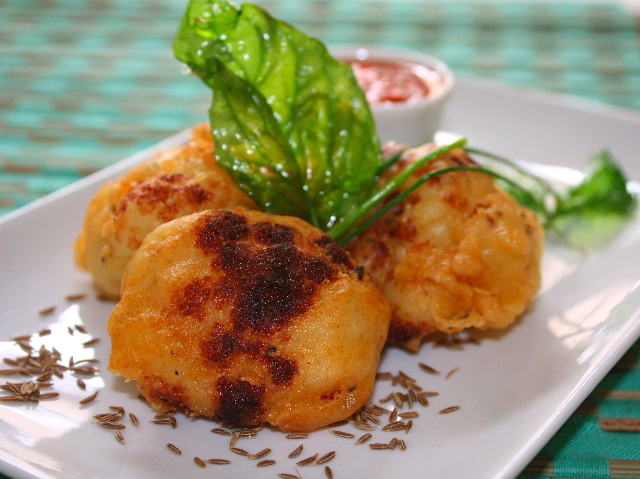 These remind me of Indian cauliflower pakoras – I love that you included cumin seeds. I think the flavour is superior to powdered cumin. Love the sauce to go with the beignets. OMG, Silvia! What a super idea. They look delicious. And that dipping sauce is perfect.